It just so happens that unpredictability and uncertainty are key indicators to the flips and turns that life takes. It also indicates time slipping away from us. The more we procrastinate, the more we realise how precious time is. Moments become hours, hours become days, days turn into years and the road leading to the path unseen takes us to our destination –death. Qurratulain Hyder, born in Uttar Pradesh, India, belonged to a modern family of writers. Through her eloquence, she made her mark in the world of Urdu literature. Hyder started writing at the time when novel was yet not discovered as a genre compatible enough to compete with that of the poetry’s in Urdu literature. Her novel, River of Fire is a philosophical and a psychological study of time itself. It brings into light the correlation of experience and nature, making one delve further in the depths of the truth that prevails within, while time is seen to be operational at a personal as well as at a collective level. Time is depicted as the ultimate authority that rules over the characters in each era, thus it would not be wrong to call it a ‘protagonist’. The ‘river’ that is emphasised upon in the novels symbolises ‘the river of time’ –the only thing that remains constant. By symbolising time, the author allows the reader to participate in a much broader aspect of reality. The heightened awareness that such art of wisdom conveys, makes the reader come in direct contact with the soul; that inner life of the individual which is sacred. 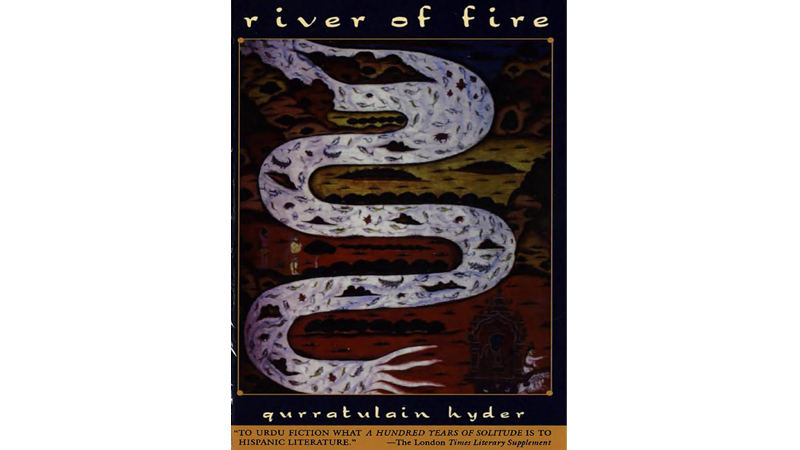 Out of all her novels, River of Fire stands out as the most unique novel ever written in the history of Urdu literature. The quest for ‘self’ and ‘love’ continues to revolve around time, the influence of which is such that the essence of the remarkable contributions made in each era, is reflected in each character. One’s sense of participation in the universe, not merely one’s own localised existence bound by the time itself, is elevated and strengthened. The quest to find a meaningful existence through personal integration and participation is shown to be continued at all times. Giving a fair representation of the beautiful traditions and cultural collage the sub-continent once held within, Hyder draws our attention towards the significance of history and time. Becoming the medium in which human life unveils, exists and fulfills itself, the order of time is set by the causal relations constituting the history of man or nature, by things done and undone with time and by the time. “Man has bound himself in his own concept of time while all the time, he is being hurtled into eternity as he revolves, dangling in time, tied to a wheel of fire”. Hyder, furthermore sketches out the tale of possession and dispossession, making sure that the characters remain closely related to one another. It is time and its power that keeps them somehow connected. The artistic touch to the description of the classical, medieval, colonial, pre-partition and post-partition eras add to the beauty of the sketch, yet it leaves many questions unanswered. The cultural blend beautifully painted on the canvas of time depicts the command on not only the history but on the art of writing as well. Aag Ka Darya is an evergreen contribution that will continue to fascinate and benefit the readers, for it fuels the fire of self-discovery and attainment of dignity within oneself. Time is cruel, in many ways. The river that flows is filled with strenuousness and hardships –for it is fire. Just when we think we are in the best phase of our lives and nothing could go wrong, we realise that it only takes moments for our ‘castle of hope’ to collapse. Yet, time shapes an individual, bringing out the true colour of “self”. After all it is only a matter of time that we are brought back to where we started from.